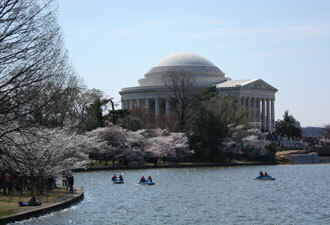 The first days of spring are unpredictable here in the nation's capital, as nature begins its annual awakening. Warm sunny days, windy cool temperatures, and rain clouds are all possible, as winter subsides. One thing you can depend on is the yearly tide of white and pink blooms blanketing the National Mall and Memorial Parks, and the multitudes of visitors who come to witness the rebirth of the cherry blossoms. 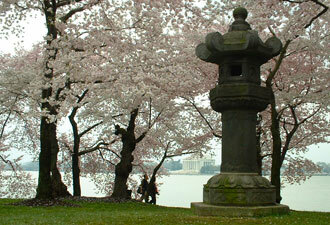 In 2012, the nation celebrates the centennial celebration of the gift from Japan of sakura, or flowering cherry trees. The first two trees were planted along the Tidal Basin on March 27, 1912 by First Lady Helen Taft and Viscountess Chinda, wife of the Japanese ambassador to the United States. The remainder of the 3,020 trees, comprised of twelve varieties, were planted soon after. With additional plantings over the years, National Park Service arborists now care for and cultivate approximately 3,750 cherry trees within the park. 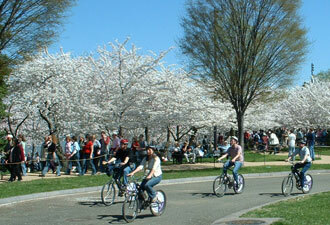 The National Park Service partners with the National Cherry Blossom Festival to host events and programs throughout the city each spring. Engaging ranger-led activities are designed to help visitors learn, get active, and immerse in the beauty of the blossoms. Rangers and volunteers mingle with visitors, offering programs on foot, bike and even by lantern light. Rangers also remind visitors not to pick the blossoms or climb the trees, no matter how tempting it might be. At peak bloom, the blossoms lend a striking accent of color to their setting, adding to the welcoming, warming rays of the springtime sun and enveloping the National Mall and Memorial Parks in a canopy of pink and white. People from all walks of life participate in hanami, the ancient Japanese ritual of enjoying the blossoms. The flowering trees are the quintessential reminder of the promise of spring, a celebration of life, and a herald of the harvest of all that follows. Their brilliance is fleeting however, at the height of their beauty the cherry blossoms fall to earth. Their radiant appearance notwithstanding, the trees reflect multiple international contributions to the unique blend of cultures that characterizes our nation. Appropriately, the trees stand among majestic monuments and memorials of Egyptian, Greek, and Roman influence that also remind us of the sacrifices and accomplishments of this diverse country. In 2012, we celebrate a new combination of man's art and nature's beauty as Japanese flowering cherry trees bloom on the grounds of the newly dedicated Martin Luther King, Jr. Memorial. Two celebrations of life stand side by side. The trees and the subsequent loss of their beautiful blossoms will also serve as a bittersweet reminder of a life cut short. Ultimately, among the legions of people who come to enjoy nature in this setting, the mood is joyous. The park resonates with the smiles and laughter of visitors viewing the beauty of the trees. They will discover history, listen to music, and sample the food of the festival that honors the Japanese flowering cherry trees. Editor's note: In 2014, ranger-led activities take place March 29 through April 13.